Well it had to happen, Carbon Pocket Calculators. 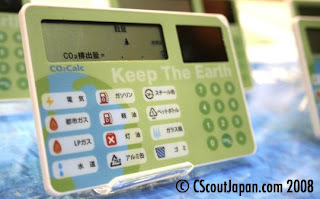 Pictured is a Japanese model that allows its user to calulate the carbon footprint you have on the earth. Everything from calculating the result of your trash, to the water you use, and the amount of eletricity and fuel you use. And in case you were wondering it is solar powered to reduce the total carbon footprint when using the calculator. Reminds me of all the superannuation calculators on the web, including this genuinely easy to use calculator by Colonial First State. There are many more online that can be found by doing a simple Google search for superannuation calculator. Point out to your employees some of the interesting and useful calculators online. They are useful in aiding your employees to think more about their superannuation. Of course don't forget to visit Superconnect where superannuation contribution payments can be simplified for you. Not only can it all be simplified but you can also seriously reduce the carbon footprint you make. Superconnect is all online and reduces the need for using paper to make all those superannuation contributions. You don't even need one of those Cabon Calculators to know that by using Superconnect you can save so much paper and hence reduce your carbon footprint. Superconnect and the new world of "Chrome"
What if we don't generate a payroll file?